1.1 The existing Fu Shan Crematorium was completed in 1984 and has been in operation since 1985. Complaints of dark smoke emission from the cremators have been received. 1.2 In 1996, the Electrical & Mechanical Services Department (EMSD) commissioned a study to explore the possibility of upgrading the existing cremators so as to protect the environment and to resolve the dark smoke problem. It was found that the cremators are near the end of their service life, and upgrading work of the existing cremators would be technically unable to satisfy the Air Pollution Control (Smoke) Regulation nor to achieve the latest requirements stipulated in BPM 12/2 - A Guidance Note on the Best Practicable Means for Incinerators (Crematoria) issued by Environmental Protection Department (EPD). 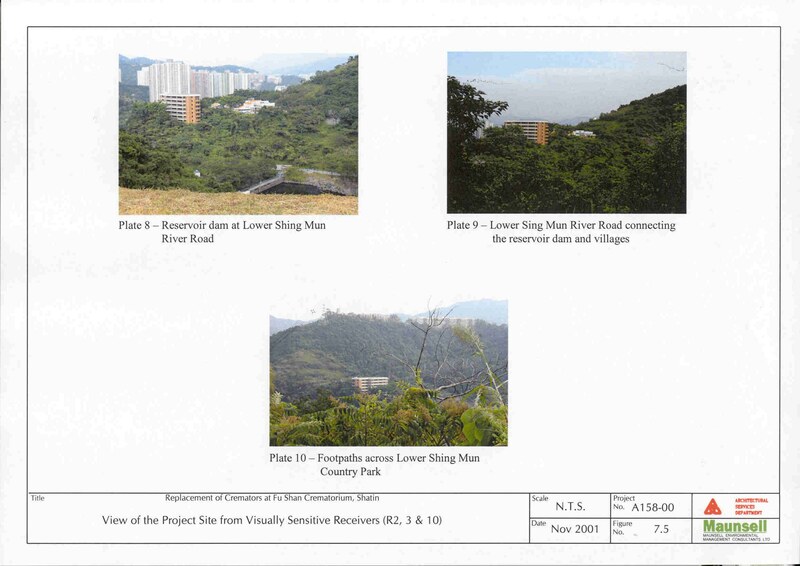 Taking EMSD recommendation, the Food and Environmental Hygiene Department (FEHD), thus, proposed to replacee the existing two twin cremators of Fu Shan Crematorium (the Project). With the replacement of cremators, the latest stringent environmental emission requirements will be satisfied, and the dark smoke problem will be resolved. The Project was welcomed by local residents and supported by the Shatin District Council, when they were consulted in July 2000. 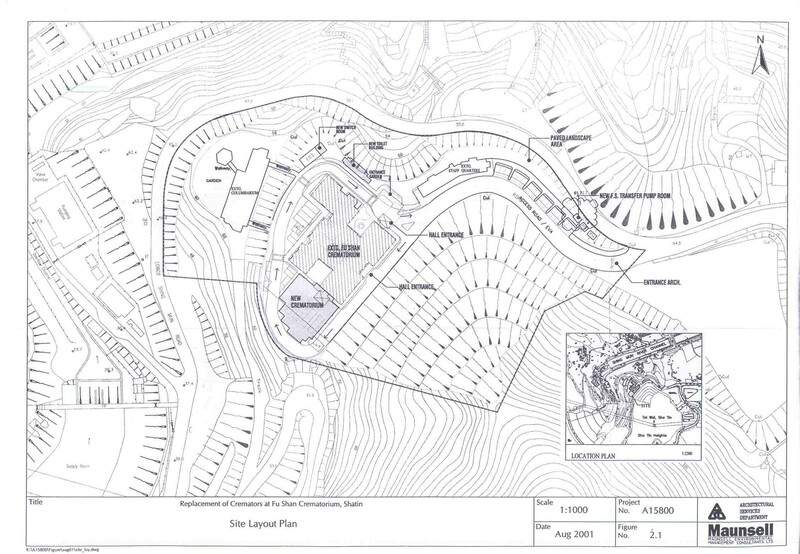 1.3 Under the Environmental Impact Assessment Ordinance (EIAO), replacement of cremators involving construction and operation of new crematorium, is a Schedule 2 Designated Project, which requires an Environmental Permit prior to the Project commencement. 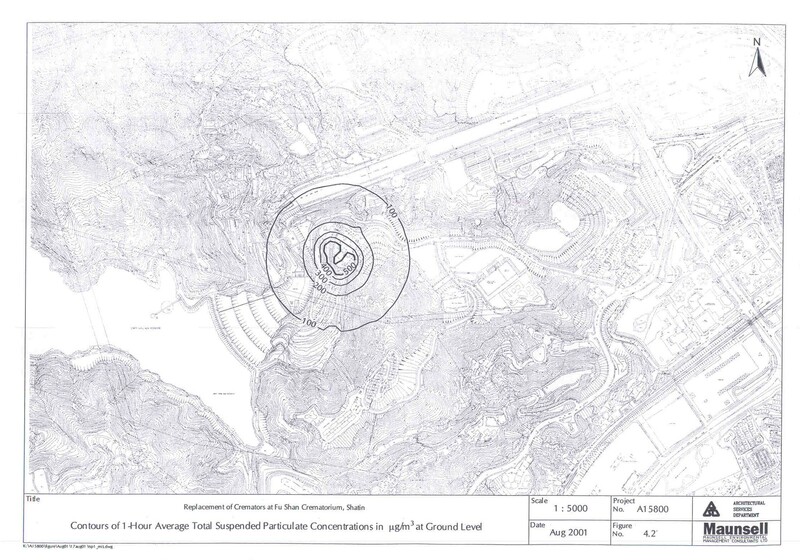 In April 2001, an application with a project profile for an Environmental Impact Assessment (EIA) study brief was lodged to EPD and the EIA study brief was issued in May 2001. The study brief requires an EIA study for the Project to assess the environmental impacts of the Project and propose mitigation measures if necessary. In addition, for the operation of the cremation plant, a specified process licence is required under the Air Pollution Control Ordinance (APCO). 1.4 Architectural Services Department (ArchSD), being the Project Proponent was responsible for the design and the construction of the cremators. After the construction work is completed, the operation of the cremators will be handed over to FEHD. 1.5 Maunsell Environmental Management Consultants Ltd. (MEMCL) was commissioned by ArchSD to assess the potential environmental impact of construction and operation the cremators. This EIA Report presents the assessment criteria, methodology, and results for the potential impact on air quality, land contamination, waste management, landscape, visual and water quality during construction and operation phases, with and without mitigation measures. The detailed environmental monitoring and audit (EM&A) requirements have also been presented in this EIA Report. iii) the acceptability of residual impacts after the proposed mitigation measures have been implemented. 1.7 This EIA Study has been carried out based on information available at the time. Relevant reports and drawings have been reviewed and findings have been incorporated where appropriate in this EIA Report. 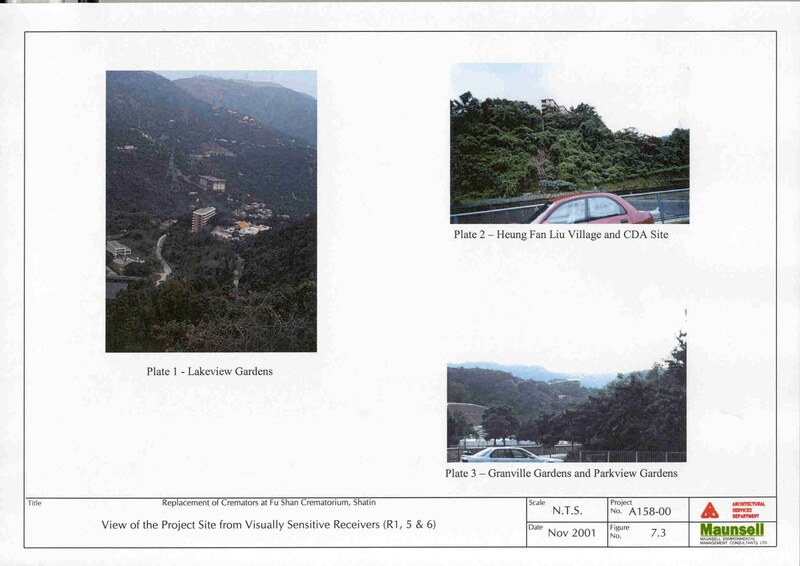 For example, findings of the Preliminary Environmental Review (PER) for the proposed “Replacement of the Existing Cremators in Fu Shan Crematorium at Shatin” carried out in 2000, have been reviewed and incorporated in this study. · Waste management for the construction and operation of the Project. 1.9 The assessment will identify impacts arising from the proposed Project on both existing and planned sensitive developments, and locations where acceptable criteria are exceeded and appropriate mitigation measures are required. 1.10 Considering the nature and environment of the project, constructional/ operational noise impact, ecological impact and impact on sites of cultural heritage are considered to be minimal. These areas have not been included in the Study Brief and are outside the scope of this EIA. 1.11 The EIA Report has been prepared in accordance with the requirements stipulated in the Technical Memorandum on Environmental Impact Assessment Process (EIAO-TM). This covers relevant project information, relevant legislation, existing environmental conditions, assessment criteria and methods, assessment findings and proposed mitigation measures. (a) Construction of a new cremation room with four flat-bed type single cremators designed to meet the latest EPD standards. 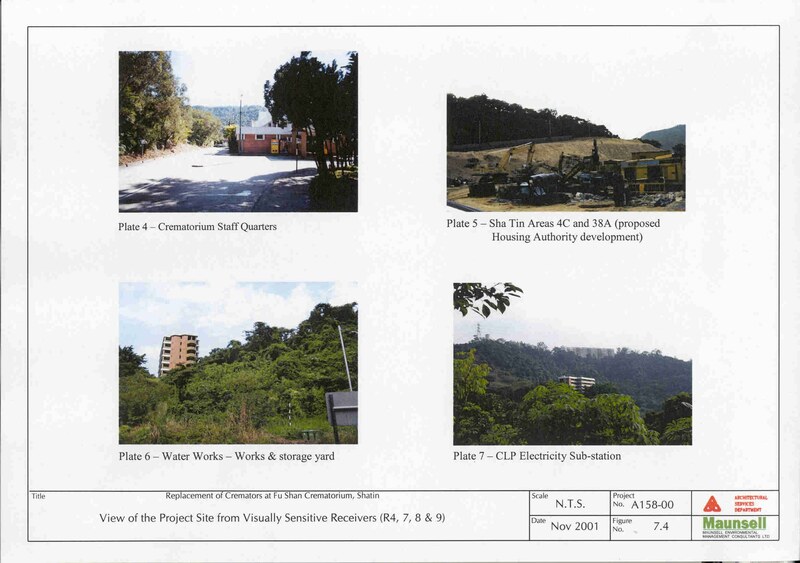 2.2 The project site lies within the site boundaries of the existing Fu Shan Crematorium, which is located in Area 18 of Shatin adjacent to Lower Shing Mun Road. The Fu Shan Crematorium site covers approximately 24,000 m2 and is currently occupied by the existing crematorium, columbarium and staff quarters. 2.3 The new crematorium will be built as an extension to the southwestern side of the existing crematorium, which is currently occupied by a public toilet, car park and garden. A chimney structure of 19 metres high above the existing ground (and at least 3m higher than the physical structure of the new crematorium building and the immediate neighbor building of the existing crematorium) will merge at the base of the new crematorium. The new emergency generator room and main switch room will be located to the north-east of the existing crematorium and next to the existing transformer room respectively, providing upgrade of power supply for the new cremators. 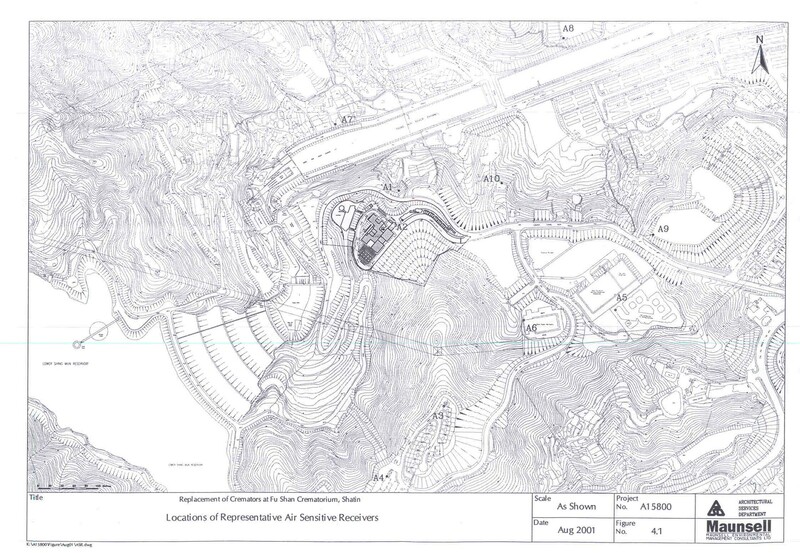 The proposed site layout plan is shown in Figure 2.1. 2.4 Four new flat-bed type single cremators will replace the existing two twin cremators. To cater for the varying sizes and weights of coffin to be handled, three cremators of design capacity 170kg and one cremator of 250kg maximum design capacity will be provided. Each cremation will last for 1-2 hours and the capacity of the crematorium is therefore 380 kg/hr to 760 kg/hr, i.e. maximum capacity of crematorium is 760 kg/hr. The maximum output of each cremator is 5 cremations per day. Since the total installed capacity of the 4 cremators is more than 500 kg/hr, the operation of the cremators will come under the control of a specified process licence. 2.5 Under the Air Pollution Control (Fuel Restriction) Regulation, the crematorium is in a “fuel restriction” area where the new cremator shall use town gas as fuel. There will be no gas storage on-site and gas supply will come directly from the gas company via pipelines. Also there will be no dangerous goods storage according to the Fire Protection Notice No.4-Dangerous Goods General issued by the Fire Services Department. 2.6 The replacement crematorium is designed in compliance with the latest edition of BPM 12/2 – A Guidance Note on the Best Practicable Means for Incinerators (Crematoria) issued by the EPD. The new cremator consists of two combustion chambers, namely primary and secondary chamber. The secondary chamber will have an operating temperature not less than 850°C and a residence time of more than 2 seconds. The concentration of oxygen at the outlet of the secondary combustion zone will be not less than 6% by volume (measured on wet basis) or an average of 6% by volume with a minimum of 3% by volume (measured on dry basis). 2.7 Dark smoke (primarily fine carbon particulate) as a result of incomplete combustion, and the entrainment of non-combustibles in the flue gas stream. To prevent the new cremator from emitting dark smoke, on the one hand the operating temperature and residence time in the secondary combustion chamber of the cremator will ensure complete combustion, on the other hand a flue gas filtering system consisting of bag filters will also be installed. When the particulate laden gas passes through the bags, particulates are retained on the upstream side of the fabric, thus cleaning the gas. Also, the emission smoke density from the cremator during normal operations (including start up and shut down) shall be continuously monitored and should not exceed Shade 1 on the Ringelmann Chart. 2.8 To further reduce the pollution emission, each cremator will be equipped with heat exchanger and a flue gas filtering plant of one-to-one arrangement at downstream side. The purpose of the heat exchanger is to cool down the flue gas in two stages from the cremator temperature of 850°C to a chimney exit temperature of 200°C. This temperature drop will discourage the generation of precursor radicals leading to the reformation of dioxins. In the first stage, the cool incoming air supplied for combustion will be pre-heated up to 300°C by the hot flue with the use of heat exchanger. The second stage will be a water-to-flue gas heat exchanger where cooling water is circulating in a closed circuit. The waste heat of cooling water will be conveyed to individual groups of remote radiator where the waste heat is disposed of to the atmosphere. 2.9 After passing through the heat exchanger, the flue gas enters the flue gas filtering plant that will clean up the specific pollutants in the gas stream. The flue gas filtering plant comprises a cyclone, an additive injection system, a conditioning rotor to recycle the additives and a flat bag filter, corresponding functions of key components are summarized in the table below. The mitigation measures stated in Sections 2.7 to 2.9 will be implemented under the control of the Specified Process Licence of the APCO. 2.10 The proposed flue gas filtering system involves only dry processes. There will be no wet scrubbing for flue gas from cremators and thus no wastewater will be discharged into the sewer. 2.11 The flue gas from each cremator after treatment will be separately ducted to a chimney structure of at least 19 metres above the formation level, which is higher than the physical structure of the new crematorium building, and the adjacent existing Fu Shan Crematorium by more than 3m. The exit flue gas will have an efflux velocity greater than 7 m/s at full load condition, and a temperature of 200°C that shall not be less than the acid dew point. Such requirements in compliance with the BPM 12/2 will come under control of a Specified Process licence of the APCO. · Stage I: Construction of a new cremator plant room, new generator room, ancillary facilities, installation of four new single cremators, renovation of the existing service halls in the crematorium. A specified process licence will be obtained for the operation of the new cremators. 2.13 The programme of the Project will last from August 2002 to June 2004, taking 17 months for Stage I to construct the new cremators and 3 months for Stage II to demolish the old cremators. Table 2.1 shows the Project construction programme. 2.14 Upon completion of Stage I construction and obtaining the Specified Process licence, there will be a commissioning period of about 3 months to allow for testing of the new cremators that includes few trial cremations to verify design data. During the commissioning test period, there would be no more than 4 cremators in operation accounting for old and new cremators. Only upon satisfactory commissioning of the new cremators, the old cremators would cease operation and be demolished and removed. The new cremator is anticipated to be operational in April 2004. 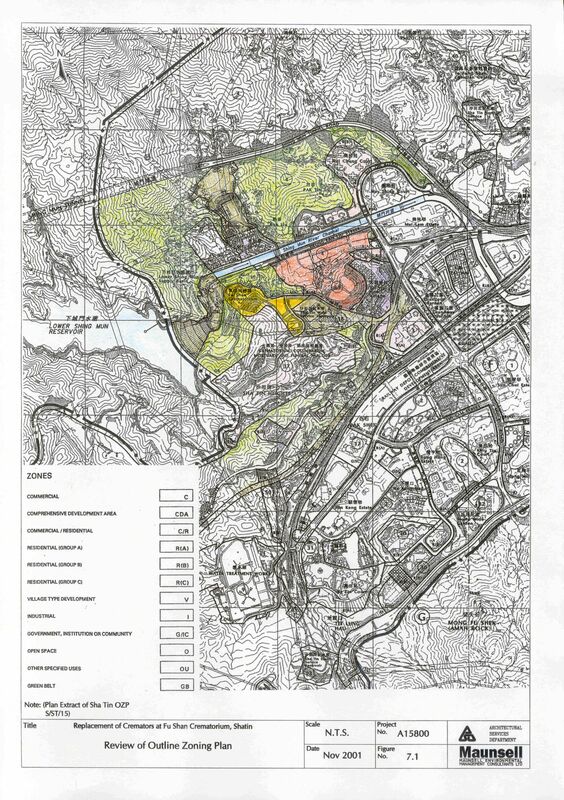 2.15 There are no other projects likely to interact with this proposed development. 2.16 The FEHD propose to protect the environment by replacing the two old cremators with new ones. The new cremators will satisfy the latest stringent environmental emission requirements and the air quality of Shatin will be improved with the Project.There is an urgent need to replace the old cremators with new ones. 2.17 The Fu Shan Crematorium is well connected with different parts of Kowloon and New Territories. To replace the existing crematorium, the alternative site should be easily accessible by the public. In addition, the infrastructure requirements, including water and electricity supplies, drainage and sewerage system and road access, of the site need to be satisfied. The new crematorium should be environmentally compatible with the site, and should satisfy the statutory requirements on land. 2.18 FEHD has conducted a site search for the crematorium relocation but no readily available new sites were identified. This Project site has been selected in view of lesser environment impact and availability of land. 2.19 Building a new crematorium at an alternative site will have no improvement of the existing crematorium from an environmental point of view. Pursuing this option and at the same time meeting the increasing demand of cremation services, FEHD will have no choice to continue operating the old cremators for a certain long period. It takes more time to get the vacant and earmarked land for this type of facilities in relevant statutory plan. Also, a longer construction period is required for the new crematorium and the associated infrastructure. Dark smoke and pollutant would therefore continue to be emitted from the old cremators for a longer time. 2.20 Given that the existing crematorium facilities are readily available, replacing the old cremators at the existing crematorium will involve smaller number of construction activities and shorter construction period. The construction impact and disturbance would be reduced to a minimum. The old cremators could therefore be phased out in a short period of time. 2.21 Location of chimney is controlled by the operational constraints of the cremation process. It should be located close to the new crematorium building so as to minimise the amount of transfer of the coffin. Also, the chimney should be away from the sensitive receivers as far as practicable. 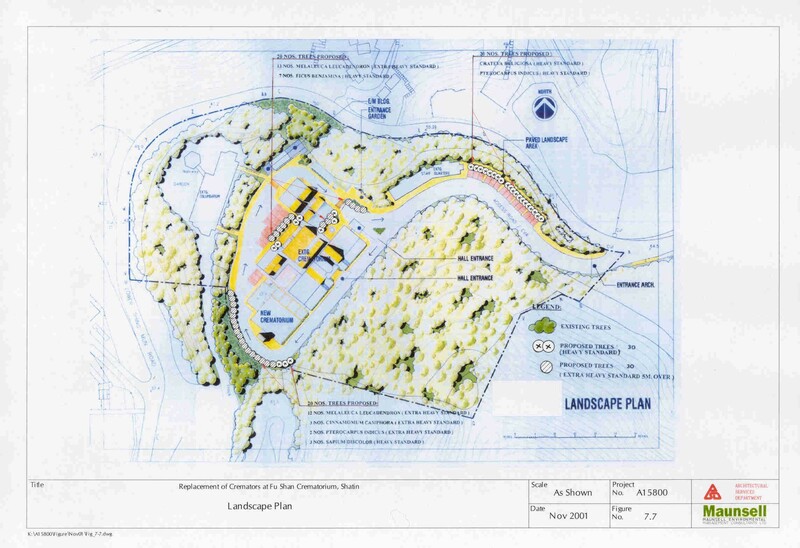 A chimney is therefore proposed adjacent to the new crematorium building, which is close to the cremator and away from sensitive receivers including the existing staff quarters. 2.22 With the new cremators, satisfying the latest stringent environmental emission requirements, emission of pollutants from the facility would be reduced and the environment will be benefited. Replacement of old cremators at the existing site was welcomed by local residents and supported by the Shatin District Council, when they were consulted in July 2000. 3.1 The Environmental Impact Assessment Ordinance (EIAO) requires all designated projects to be subject to the EIA process and applies to most of the major infrastructure projects. This Project involving the construction and operation of a crematorium is considered to be a designated project under Schedule 2, Part I (N.4) of the EIA Ordinance. 3.2 A Technical Memorandum on EIA Process issued under Section 16 of the EIA Ordinance (EIAO-TM) sets out the principles, procedures, guidelines requirements and criteria for preparing and reviewing an EIA report. 3.3 The criteria for evaluating air quality impacts and the guidelines for air quality assessment are laid out in Annex 4 and Annex 12 of the Technical Memorandum on Environmental Impact Assessment Process (EIAO-TM), respectively. 3.4 The Air Pollution Control Ordinance (APCO) provides the statutory authority for controlling air pollutants from a variety of sources. The Hong Kong Air Quality Objectives (AQOs) should be satisfied at the Hong Kong Special Administrative Region (HKSAR). The AQO stipulate the maximum allowable concentrations for typical pollutants, of which total suspended particulates (TSP), respirable suspended particulates (RSP), nitrogen dioxide (NO2) and carbon monoxide are relevant to this EIA Study. The relevant AQOs are listed in Table 3.1. 1. Measured at 298 K and 101.325 kPa. 2 Not to be exceeded more than three times per year. 3 Not to be exceeded more than once per year. 5 Suspended particulates in air with a nominal aerodynamic diameter of 10 mm or smaller. 3.5 The Technical Memorandum for Issuing Air Pollution Abatement Notices to Control Air Pollution From Stationary Polluting Process, stipulated that the Health Protection Concentration Level (HPCL) of chlorinated dioxins and dibenzofurans (expressed as 2,3,7,8 –TCDD) is 3.36 x 10-5 mg/m3 (hourly average). 4. Guidelines for Air Quality, World Health Organisation, 2000. 3.7 The EIAO-TM also stipulates that the hourly TSP level should not exceed 500 µgm-3 (measured at 25°C and one atmosphere) for construction dust impact assessment. Mitigation measures from construction sites have been specified in the Air Pollution Control (Construction Dust) Regulations. 3.8 In accordance with the EIAO-TM, odour measured at a sensitive receiver should not exceed 5 odour units based on an averaging time of 5 seconds. 3.9 Under the Air Pollution Control (Specified Process) Regulation, incinerator (including cremator) with installed capacity exceeds 0.5 tonne per hour, is classified as a specified process, and a Specified Process licence is required for its operation. 3.10 The Air Pollution Control Ordinance provides legislative control on the removal of asbestos-containing materials. Under the APCO, The Environmental Protection Department (EPD) endorses the asbestos investigation report (AIR) and asbestos abatement plan (AAP) prepared in accordance with the relevant codes of practice by a registered asbestos consultant. The AAP specifies the proper asbestos abatement procedure that has incorporated mitigation measures to check the asbestos fibre release and hence to minimize the potential impact. Moreover, the APCO requires registered professionals to undertake, supervise, audit and air-monitor the asbestos abatement work. 3.11 Health risk from exposure to air toxics is not currently control by the HKSAR Risk guidelines for the assessment of health risk from exposures to air toxics are given by California Air Resources Board, California Environmental Protection Agency (CARB). Guidelines value on acceptability of increased cancer risk from a lifetime exposure to air toxics have been provided and are shown in Table 3.3. 3.12 Contaminated land assessment in Hong Kong is investigated under the EPD’s direction in accordance with their Practice Note for Professional Persons (ProPECC PN 3/94) Contaminated Land Assessment and Remediation, the EIAO TM, and EPD’s Guidance Notes for Investigation and Remediation of Contaminated Sites of Petrol Filling Stations, Boatyards and Car Repair / Dismantling Workshops (1999). 3.13 Under the EIAO TM, Annex 19: Guidelines for Assessment of Other Impacts, consideration shall be given to a number of potentially contaminating land uses, including petrol filling station, shipyards, car repair / dismantling workshops. Annex 19 provides guidance on developing a framework for a Contamination Assessment Plan (CAP), Contamination Assessment Report (CAR) and Remediation Action Plan (RAP) for land with a high contamination potential. · Code of Practice on the Handling, Transportation and Disposal of Asbestos Waste. 3.16 Under the Waste Disposal (Chemical Waste) (General) Regulations all producers of chemical waste must register with the EPD and treat their wastes, either utilising on-site plant licensed by the EPD, or arranging for a licensed collector to transport the wastes to a licensed facility. The regulation also prescribes the storage facilities to be provided on site, including labelling and warning signs, and requires the preparation of written procedures and training to deal with emergencies such as spillages, leakages or accidents arising from the storage of chemical wastes. 3.17 The current policy relating to the dumping of construction and demolition (C&D) material is documented in the Works Branch Technical Circular No.2/93, “Public Dumps”. Construction and demolition materials that are wholly inert, namely public fill should not be disposed of to landfill, but taken to public filling areas which usually form part of reclamation schemes. The Land (Miscellaneous Provision) Ordinance requires that dumping licenses are obtained by individuals or companies who deliver public fill to public filling areas. The licenses are issued by the Civil Engineering Department (CED) under delegated powers from the Director of Lands. 3.18 In addition to the Works Branch Technical Circular, EPD and CED have produced a leaflet entitled ‘New Disposal Arrangements for Construction Waste’ (1992) which states that C&D material with less than 30% by weight (or 20% inert material by volume) of inert material (i.e. public fill) will be accepted at landfill. If the material contains more than 30% inert material, the waste must be sorted and sent to a public filling area and the non-inert material (i.e. C&D waste) can be sent to landfill for final disposal. 3.20 Government guidelines on the preservation and felling of trees in Hong Kong are detailed in Government General Regulation 740, Works Branch Technical Circular No. 24/94 and Planning, Environment and Lands Branch Technical Circular No. 3/94. Documents that are also relevant to landscape and visual aspects include WBTC 25/93 on Control of Visual Impact of Slopes, WBTC 18/94 on Management and Maintenance of both Vegetation and Landscape Works, WBTC 17/2000 on Improvement to the Appearance of Slopes and HyDTC No. 6/98 on Visibility of Directional signs. 3.21 The Water Pollution Control Ordinance (Cap.358) provides the major statutory framework for the protection and control of water quality in Hong Kong. According to the Ordinance and its subsidiary legislation, all Hong Kong waters are divided into Water Control Zones (WCZ). 3.22 All discharges during the construction phase are required to comply with the Technical Memorandum (TM) on Standards for Effluents Discharged into Drainage and Sewerage Systems, Inland and Coastal Waters issued under Section 21 of the WPCO which defines acceptable discharge limits to different types of receiving waters. Under the TM, effluents discharged into foul sewers, storm water drains, inland and coastal waters are subject to pollutant concentration standards for particular volumes of discharge. These are defined by EPD and specified in licence conditions for any new discharge within a WCZ. 3.23 Chapter 11 of the Hong Kong Planning Standards and Guidelines (HKPSG) requires risk assessment for the potentially hazardous installation (PHI). By definition, a PHI is an installation which stores hazardous materials in quantities equal to or greater than a substance-specified threshold quantity, Relevant to this study, the threshold quantity for Town Gas installation is 15 tonnes. 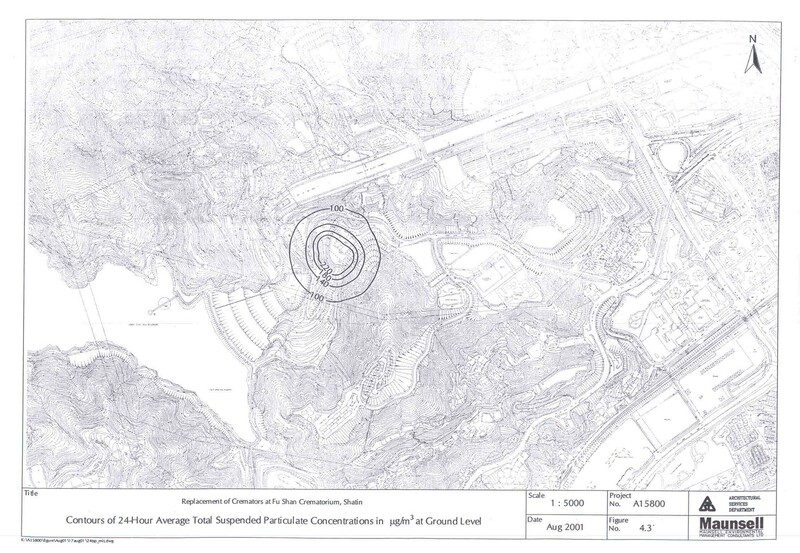 4.1 This Section presents an assessment of air quality impact from the construction and operation of the Project. Air Sensitive Receivers (ASRs) have been identified and their respective impacts have been assessed, on a worst-case scenario basis. 4.2 Construction dust from the dusty activities and chimney emissions from the operation of cremators are major areas of concern for this Project. The air quality impacts, from both the construction and operation of the crematorium, have been assessed quantitatively in this Section. Mitigation measures, where necessary, have been recommended to ensure that the environmental legislation, standards and criteria, stipulated in Section 3, are satisfied. Environmental Monitoring and Audit (EM&A) requirements of the Project have been proposed and described in Section 10, to ensure the specified criteria are satisfied. 4.3 The study area is located in the Sha Tin airshed. Under the Air Pollution Control (Fuel Restriction) Regulation, only gaseous fuel is allowed in the Shatin area. Air quality of the study area is mainly affected by the traffic emissions from the existing road networks. Emissions from the existing crematorium also contribute to the pollutants of the area. 4.4 The EPD’s Sha Tin Air Quality Monitoring Station is located at the rooftop of Sha Tin Government Secondary School. Concentration of Total Suspended Particulates (TSP), Respirable Suspended Particulates (RSP) and nitrogen dioxide (NO2) are monitored in the station. The long-term (annual) and short-term AQO (in terms of TSP, RSP and NO2) were satisfied at the station in 2000. The annual average concentrations, measured at the Shatin Station have been selected as the background of the area, and their values are listed in Table 4.1. 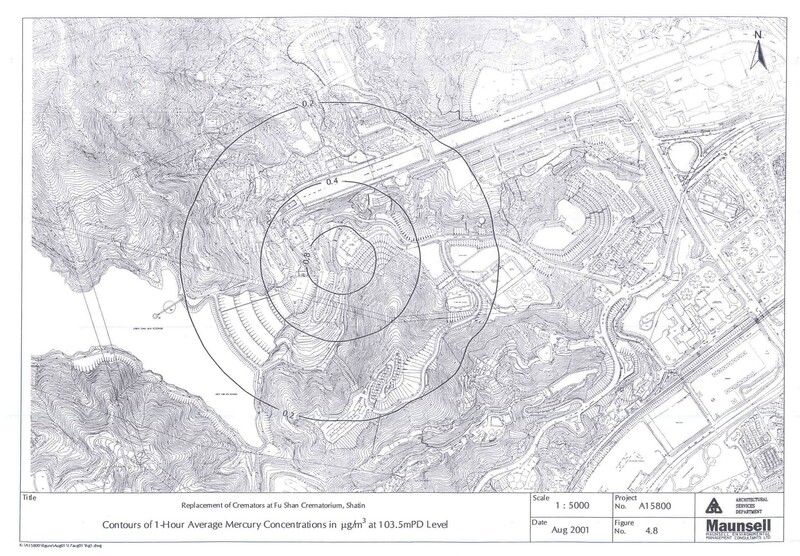 Both carbon monoxide (CO) and dioxins are not monitored in the station, and the annual average levels of the two parameters monitored at the Tsuen Wan Station have been employed as background for this Study. 1. Expressed as TCDD-equivalent concentration of 2,3,7,8-tetrachlorobenzo dioxin (TCDD). 4.5 The existing Fu Shan Crematorium, comprising four cremators, is a pollutant source of the Shatin and dark smoke is emitted from the facility during some periods. Measurements of the pollutant concentrations from the stack have been conducted for the existing crematorium on 27 March 2001. During the measurement periods, only one cremator was operated. Other cremators were either inactive or under maintenance. Concentrations of particulate matters, hydrogen chloride (HCl), carbon monoxide (CO), total organic compounds (TOC), dioxins and furans have been measured and their results are summarised in Table 4.2. (1) Expressed as reference conditions of dry, 0oC, 101.325kPa, 11% O2. (2) Figure in italic exceeded the BPM requirement. 4.6 Low levels of dioxins and furans were emitted from the existing crematorium. A number of dioxin and furan congeners have been shown to exert a number of toxic responses similar to those of 2,3,7,8-tetrachlorodibenzo-dioxin (TCDD), the most toxic dioxin. Levels of dioxins and furans are usually expressed as toxic equivalent (I-TEQ) concentration of 2,3,7,8-TCDD, based on the International Toxic Equivalent Factors (I-TEF) of the North Atlantic Treaty Organisation (NATO/CCMS), 1988. Appendix 4.1 shows the calculation of dioxin and furan toxic equivalents. 4.7 It is understood that pollutant emissions from the cremator are controlled by weight and composition of coffin (e.g. thickness of lacquer applied). The amount and type of mementos being incinerated would also contribute to the emission of the pollutants. The results of stack emission measurements, listed in Table 4.2 above, are typical emission concentration from the facility. Higher concentration of pollutants may be emitted from the crematorium, under worst case scenario. However, the measured emission data did indicate that the CO emission from the facility is high and exceeds the EPD’s current BPM requirement. CO is a product of incomplete combustion and its presence is related to insufficient oxygen, residence time, temperature and turbulence in the combustion zone. The new cremators will provide adequate oxygen, temperature, residence time and turbulence to control emissions from the facility, and satisfy the BPM concentration limits. It is expected that phasing out the old creators with new one will reduce emission from the facility and therefore improve the air quality of the area. 4.8 Ten representative Air Sensitive Receivers (ASRs), including a school, residential areas, and G/IC areas, have been identified for this assessment in accordance with the criteria set out in the EIAO-TM. Description of the ASRs and their horizontal distance from the crematorium are listed in Table 4.3. Locations of the ASRS are shown in Figure 4.1. It is understood that ASR A10 will not be developed until 2004, and the receiver is therefore identified as ASR during the operation phase only. (1) Distance measured from the chimney to the site boundary of ASRs. (3) Areas 4C & 38A Developments are to be developed for schools, Home Ownership Scheme (HOS) and Public Housing Estate, 8 and 40 numbers of floor were assumed for schools and residential blocks respectively. 4.9 Potential impacts arising from the construction of cremators include dust nuisance and gaseous emissions from the construction plant and vehicles. It is expected that dust would be generated from foundation works, site clearance, excavation, material handling and wind erosion. 4.10 The Fugitive Dust Model (FDM) was used to assess the potential dust impacts from dusty construction activities. Prediction of dust emissions was based on emission factors from USEPA Compilation of Air Pollution Emission Factors (AP-42), 5th Edition. General construction activities (comprising foundation, site clearance and excavation) and wind erosion of open sites were considered to be the major dust emission sources from the construction work in this study. Demolition works will be conducted inside the existing crematorium, involving no structural demolition. Dust emissions from the demolition works will be low. 4.11 The dust emission factors adopted in this assessment are given in Table 4.4. Detailed calculations of the emission factors are provided in Appendix 4.2. 4.12 The Air Pollution Control (Construction Dust) Regulation specified that reduction measures such as watering should be applied for the construction site. The control measures could reduce dust emission from the site by 50% and was assumed in the FDM model. 4.13 Hourly average and 24-hour average TSP concentrations were predicted at the ASRs. A ten hour working day was assumed in the assessment. 4.14 The dispersion model was undertaken for 288 predetermined meteorological conditions. The following meteorological conditions have been assumed in the model. Highest dust impact at each ASRs, under their respective worst meteorological conditions, was predicted by the FDM model. 4.15 Background TSP concentration of 58 mg m-3 has been included in the modelling results to account for the cumulative impact. 4.16 A sample output file of the FDM model run, which includes all the input information and model parameters for this assessment, is presented in Appendix 4.3. 4.17 Given the legislative control on asbestos in place, the impact of asbestos fibre was assessed by reviewing the mitigation measures as stipulated by the current ordinance and regulation. Adequacy of mitigation measure has been reviewed and the significance of impact was predicted. · 4600 m3/ hr (at 11% O2 and 12.7% H2O) for the 250 kg cremator1. 4.19 The emission rates, corrected to reference condition of 273 K, 101.3 kPa, 11% O2 and dry condition, are calculated to be 1654 m3/hr for the 170 kg cremator and 1926 m3/hr for the 250 kg cremator. 4.20 The new cremators are equipped with air pollution control devices to reduce emission of air pollutants to acceptable levels. The latest BPM 12/2 emission concentration limits will be satisfied for the new cremators. Adoption of the BPM 12/2 emission concentration limits will ensure adequate protection of human health and the environment. 4.21 Both the ArchSD and FEHD are committed to minimize pollutant emissions, and state-of-art cremators will be installed. The final selection of cremators will be subject to competitive tendering with the successful supplier selected on the basis of various factors, including the ability to meet the pre-determined performance specification with respect to emissions. In the commercial market, cremators satisfying the German Emission Standards are available. The German Emission standards are more stringent than the BPM 12/2 emission concentration limits and a comparison of the two standards is shown Table 4.5. 4.22 Mercury (Hg) emission is not currently controlled by the BPM 12/2. There are public concerns on mercury exposure, mainly attributed to dental fillings, on cremation of human remains. Mercury, due to its high vapour pressure, could not be controlled by particle enrichment (usually employed for metal emissions) and is emitted largely in the vapour form. It is proposed by some Federal States in Germany that the mercury emission from cremator should be limited to 0.2 mg/m3. 4.23 The design of the new cremators will satisfy the German Emission Standards, including the proposed mercury emission limit. 4.24 The FEHD targets to satisfy the German Emission Standards listed in Table 4.5, in the long run. Training and instructions in relation to the control of the process and emissions of air pollutants will be provided to crematory staff at all levels, to ensure that the cremators are operated according to the manufacturer’s instructions. Effective regular maintenance will be employed on the cremators and associated equipment. Other control measures will also be exploited to ensure that the target emission limits are satisfied. 4.25 With the new cremators, the current pollutant emissions will be reduced and the latest BPM 12/2 emission concentration limits will be satisfied at all times. With the target emission limits achieved in the long run, it is likely that cremator emissions could be further reduced. 4.26 This air quality assessment was conducted based on the worst case scenario of the new cremators, i.e. BPM 12/2 concentration limits. Air quality impact of the mercury emission was also assessed against the international criteria in this EIA Study. (1) Expressed at reference conditions of 0oC, 101.325 kPa, 11% O2 and dry conditions. (2) Germany Emission Standards for Cremator. 4.27 The concentration limits stipulated in the BPM 12/2, were assumed in this assessment, as a conservative approach. Mercury emission limit of 0.2 mg/m3 was also assumed for the cremators. The emission rates of cremators employed in the Study are summarised in Table 4.6. It is assumed that the size of particulate matter emitted from the chimney is less than 10 mm (i.e. within the RSP category), and emission limit of particulate matter, 100 mg/m3, is assumed for RSP. (1) Expressed as reference condition of 0oC, 101.325 kPa, 11% O2 and dry condition. (2) Flow rate of 1654 m3/hr at reference conditions. (3) Flow rate of 1926 m3/hr at reference conditions. 4.28 Air quality impacts of the chimney emissions were modelled with the US EPA approved air dispersion model, Industrial Source Complex Short-Term (ISCST3). Concentrations of RSP, CO, HCl, TOC, Hg, and dioxins have been modelled. 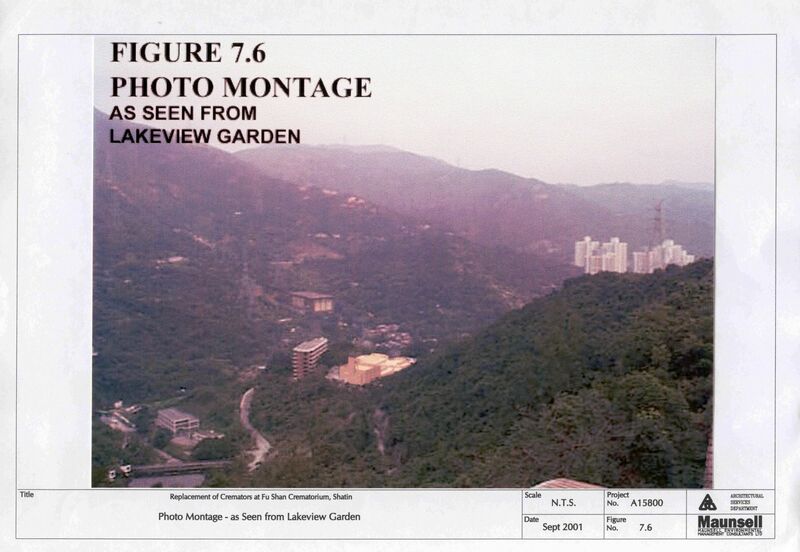 Hourly meteorological data for the year 2000 (including wind speed, wind direction, air temperature, Pasquill stability class and mixing height) of the Shatin Weather Station were provided by the Hong Kong Observatory and have been employed for the model run. The ISCST3 model simulated the pollutant concentrations at the ASRs for each hourly meteorological data in year 2000, and the worst case scenario have been predicted by the model. 4.29 The crematorium operates between 09:30 hours and 18:00 hours, and a maximum of 5 cremations will be conducted for each cremator. It was assumed in the air dispersion model that the cremators would be operated in full capacity with maximum load during the operation hour, as a worst case scenario. 4.30 Sample output files of the ISCST3 model are given in Appendix 4.4. 4.31 Health risk assessment has been calculated based on the risk imposed by toxic air pollutants (TAP). The increase cancer risk due to exposure of TAP is determined by multiplying the increase in predicted annual average of the TAP concentration with its unit risk factor. 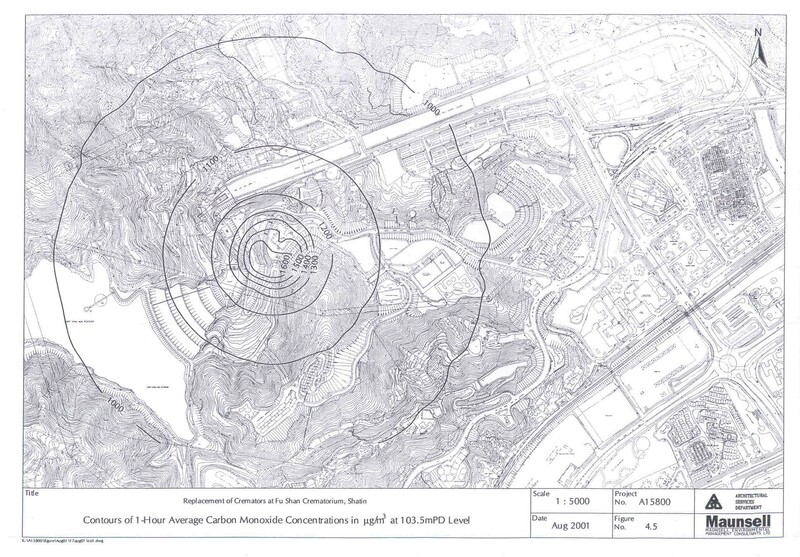 The California Environmental Protection Agency, 1999 has identified that the unit factor of dioxins (expressed as 2.3.7.8 – TCDD) associated to lifetime exposure of 70 years to be 38 (mg m-3)-1, and the value is considered up-to-date (during preparation of this report, the addendum of 9th report on Carcinogens from US National Toxicology Program made in early 2001 was reviewed and no amendment was noted on the year 1999 figure of unit risk factor) and employed for this assessment. The predicted value is compared with the health risk guideline indicated in Table 3.3. 4.32 The coffin is delivered by mortuary vehicle outside the ceremony hall. It is brought to the hall immediately, and exposure of human remains in air is not expected. The coffin stays at the ceremony hall during the farewell ceremony, and is delivered to the cremation hall afterwards. All the processes are conducted in an enclosed environment, and odour emission from the crematorium building is not expected. 4.33 The new cremators are designed to ensure complete combustion and are fitted with a secondary combustion zone at high temperature. All cremators are operated at negative pressure and are designed with adequate secondary air in the primary combustion zone to ensure good turbulence and combustion. The gases are held at 850oC for minimum of 2 seconds in the secondary combustion zone. Odorous gases exist in organic forms; the gases will be broken down into simple substances, under such high temperature with sufficient residence time. With the negative pressure along the cremator, leakage of odorous gas is also not expected. The subsequent flue gas filtering system would also remove any trace amount of odorous gas that escapes from the combustion chamber. Odour emission from the cremators is therefore unlikely. 4.34 Construction dust impacts at the ASRs have been predicted for this assessment. Both the 1-hour and 24-hour average TSP concentrations have been assessed. The worst impacted height (i.e. same elevation as the source) has been predicted and the results are shown in Table 4.7. As discussed in Section 4.8, ASR A10 will not be operated until year 2004, and its impact is therefore not assessed for the construction phase. (1) Background TSP level of 58 mg/m3 included in the figure. 4.35 It has been predicted that TSP levels at the ASRs are low, and comply with the hourly criteria of 500 mg/m3 and daily criteria of 260 mg/m3. Maximum hourly TSP level of 191 mg/m3and daily TSP level of 117 mg/m3 have been predicted at ASR A2. Contours of hourly and daily average TSP concentrations are presented in Figures 4.2 and 4.3. 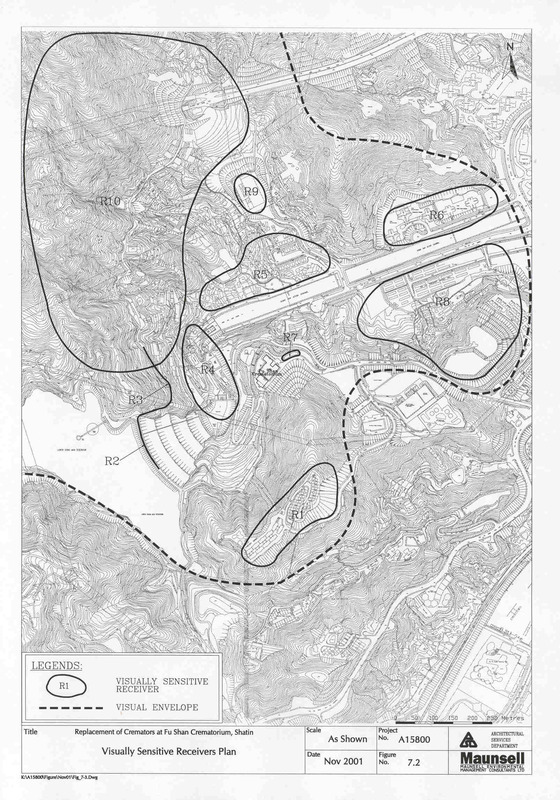 They confirmed that the construction TSP impacts are low in the study area. No further mitigation is therefore required. · Air monitoring during the asbestos abatement work. · a registered asbestos consultant supervise the carrying out of and to certify the asbestos abatement work. 4.38 Air quality impacts of RSP, CO, HCl, TOC, Hg, and dioxins have been predicted at the ASRs. A10 and A4 have been identified as the worst impacted ASRs, and their pollutant concentrations are shown in Table 4.8. (1) Background included for RSP, CO and dioxins in the figure. 4.39 It has been assessed that the air quality impacts at the worst impacted ASRs will be low. Under the worst case scenario, the air quality criteria would be satisfied at the worst impacted ASRs. This assessment assumed that the cremators are operated in full, and that the highest allowable concentrations of pollutants are emitted. 4.40 Table 4.9 – Table 4.19 presents the predicted air quality impacts at the ASRs. Modelling results indicated that the air quality criteria would be satisfied at all ASRs, during the operation of the Fu Shan Crematorium. 4.41 Contours of the hourly average of gaseous pollutants (CO, HCl, TOC Hg and dioxins) and daily average of RSP at the worst affected heights, 90 m above local ground of A10 (i.e. 103.5 mPD) have been plotted and are shown in Figures 4.4-4.9. They confirm that the air pollutants emitted from the crematorium will not cause exceedance of air quality criteria near the site. * Background PM concentration of 46 mgm-3 is included. -- No air sensitive receiver is located at this elevation. --No air sensitive receiver is located at this elevation. * Background CO concentration of 915 mg m-3 is included. * Background not included in the figure.